Bar material warm(hot) shearing line is a mechatronics integrated and precise production. It is widely used in the industries of bearing, automobile, metallurgy, petroleum and forging etc. it is the ideal shearing equipment for high efficiency bar material shearing. 1) The machine body is integral welding structure and it has adequate strength and stiffness, perfect precision durability. 2) Two level upper transmission, smooth and steady, low noise. 3) Rectangular inlaying steel guide rail is used for the slider with good abrasion performance. 4) Side pulling structure for blade changing, it is safe, rapid and labor saving. Pneumatic friction clutch and circular water coolant compulsory brake, they are flexible, reliable and convenient for maintenance. 5) Big size fly wheel is a kind of optimized design and the support structure is with unloading bush. 1) There is no material loading shelf and compulsive feeding mechanism for the feeding system, that can realize the function of automatic loading and feeding material. 2) Forced lubrication by engine driven thin oil, it has the safety protection functions of alarming for sufficient oil, oil way jamming and abnormal lubrication. 3) Medium frequency induction heating mechanism has the infrared thermometer and the touch screen for man-machine interaction, which can realize the function of automatic temperature control. 4) Program controlled flexible mechanism for stopping material, which can realize the function for not shearing if the material is not in place and automatic shearing if the material is super short. 5) Output sorting structure, it can realize the function of automatic sorting for the finishes and the stub bars. 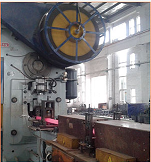 6) So many functions are achievable such as blade quick-changing, automatic material loading and feeding, automatic sizing, shearing, counting, automatic sorting for qualified and unqualified bars, automatic material piling, lubricating, alarming for oil empty, low pneumatic pressure, motor overloading and automatic stopping for protection etc.